We are welcoming applications from March 2019.
bring optics, ideally a pair of binoculars and a scope. Accommodation is organised at the guesthouses in the village of Sakhalvasho. The guesthouses have several rooms shared by 2 people. Hot shower, toilets and a washing machine are available to be shared responsibly. Bed linen is provided by the accommodation, however, please bring your own towel. All volunteer accommodation is close to each other, and within walking distance of count station 1, the office and the Green Bar. Wireless internet, although irregular and often slow, is available in the houses and around the office. Delicious food is provided by our host families: breakfast and dinner are served at the guesthouses and lunch is packed to be eaten at the count station. Transportation: going to the stations and coming back is done on foot (station 1) or with regular BRC drivers in a minibus (station 2). Days off: during your stay you have one day off per week to rest and explore the surroundings. Introduction and training: volunteers will receive a protocol before the start of the count, an introduction presentation on arrival and some time on the spot to get used to the working environment. Some evenings, coordinators will give training presentation to identify groups of raptors. Pleasant atmosphere: we will make sure the atmosphere is at it's best, and everyone can enjoy their time with the BRC. Good comfort for everyone is important, as well as a quiet and relaxed environment to work and rest in. During the season, volunteers and visitors can have a drink in the village "Green Bar". A contribution of €16 (about 48 GEL) per person per day will be asked to help us cover the expenses for counters. Half season and full season counters will have a reduced daily fee (€12 and €8 per day respectively). As we are happy to have counters from Georgia in our count, these counters will be able to stay with us for free. You can indicate the preferred duration and timing of your volunteering in the application form. 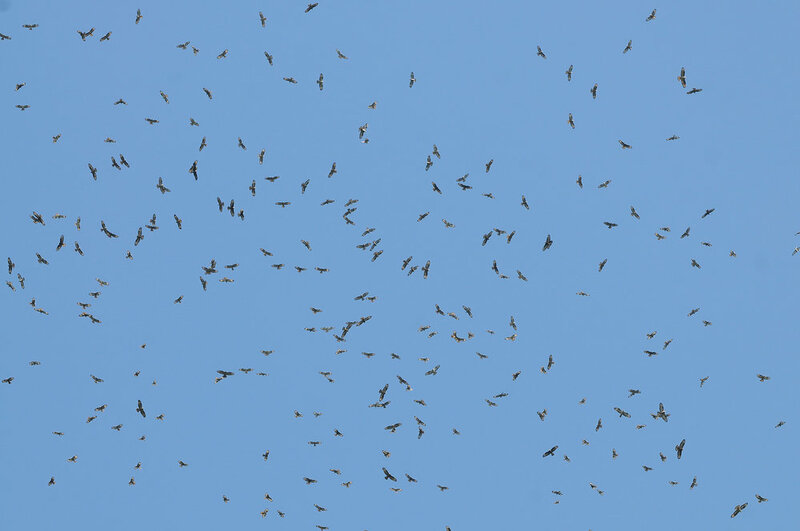 A flock of Honey Buzzards. Photo by Christian Gelpke. As one of the major bottlenecks for raptor migration worldwide, you can expect to see lots of birds of prey. The season starts building up to the peak of Honey Buzzards and Montagu's Harriers towards the first days of September, during mid September there is a nice diversity with more species mingling in and towards the last days of September the numbers build up towards the peak of Steppe Buzzard and Lesser Spotted Eagle. If you are not that experienced with identifying all those different raptors, who are usually not easy to identify, don't worry. We try to mix experienced and less experienced, and give new arrivals the opportunity to get to know the procedures on the first day(s) without actively participating in the count. Everyone will get a presentation about the protocol and will have the opportunity to attend several presentations about the hard to identify raptors (like harriers and eagles). The BRC is one of the best schools to get to know raptors better, and learn quickly about their identification, as you get plenty of opportunities to see multiple raptor species migrate, in all their different plumages, at close range and further away. If you are interested in more numbers, daily totals and phenology, have a look at our migration count data or read through some of the autumn reports.